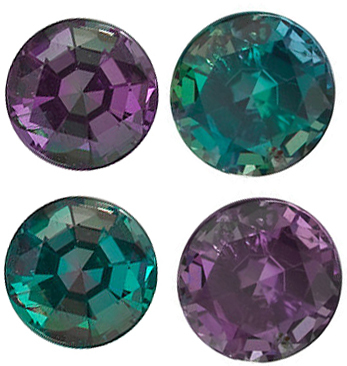 Genuine Round Cut Alexandrite in Grade AAA Grade AAA Alexandrite Gems will display a tealish fine green color of medium deep tone in daylight and a fine pinkish purple of medium deep in incandescent light. The degree of color change can be described as excellent, or on a percentage scale approximately 90%. Internal inclusions can only be seen with very good lighting and will not be seen in normal lighting conditions. Our Natural Alexandrite Gemstones are not subjected to any treatments of any kind. Our Alexandrite gemstones are sourced from Brazil, not India. Check out the quality of this perfect Alexandrite gemstone that is for sale now at AfricaGems. By perfect I mean all aspects of this gemstones are as good as it gets. This very large 2.27 carat Alexandrite from Brazil is clean (eye clean plus), very well cut (no excess weight on the pavilion) and of course a dramatic 100% color change. In the world of gemstones, real alexandrite stone is a fairly "new" gemstone. True, it has been part of the earth for millions of years, but unlike many other gemstones, it wasn't known and used in jewelry by the ancient Greek or Romans or any ancient peoples. It was discovered in the mid-1830s in the Ural region of Russia. Some believe that genuine alexandrites were discovered after a local peasant discovered emeralds in the roots of a fallen tree which led to emerald mines being opened in the area and that led a few years later to the discovery of a new gemstone - natural color change alexandrite. The actual name of the person who first discovered this gemstone is not known, but the first person to bring it to the attention of the public was Count Lev Alekseevich Perovskii, an avid collector of minerals and precious stones and also the man who was in charge of management of the Russian Imperial Family estates and income. It has been said that Count Perovskii turned to Nils Gustaf Nordenskijold who had an exceptional and comprehensive knowledge of gemstones, to examine the newly found mineral. It appears that Nordenskijold at first identified the mineral as emerald but he was confused by the high hardness. And, it seems that he first looked at the mineral sample during daylight hours, set it aside to look at later, and then was looking at the specimen by candlelight when he noted that the color of the stone had changed to raspberry-red. He later confirmed that the sample was a new variety of chrysoberyl. Count Perovskii, wishing to ingratiate himself further with the Imperial family, presented the rare gemstone specimen to Tsarevich Alexander, future Tsar of Russia and named the gemstone Alexandrite in his honor. Add the fact that alexandrite colors are also the colors of Russian Imperial Guard alexandrite became the official gemstone of Tsarist Imperial Russia. For many years after its discovery, Alexandrite was pretty much limited to the Imperial Family and the upper echelons of the aristocracy. Master Russian jewelers loved this stone and who knows, you might be one of the few lucky ones to come across an antique piece of Russian alexandrite jewelry. George Fredrick Kunz, Tiffany's master gemologist was also a big fan of alexandrite and Tiffany's produced some exquisite rings and platinum ensembles containing alexandrite at the end of the 19th and beginning of the 20th centuries. What Kind of Gemstone Is Natural Alexandrite? Natural Alexandrite is a Color Change Chrysoberyl. Chrysoberyl is a relatively small species of gemstones, basically consisting of 3 varieties: golden chrysoberyl (yellow, yellow-green, yellow-golden or brownish), golden cat's eye chrysoberyl and alexandrite (which can also be cut in cat's eye cabochon). Please do not confuse chrysoberyl with the "other" beryl species that is aquamarine, emerald, morganite, and golden beryl. They are not related. Of the chrysoberyl species, alexandrite is far and away the most rare. Golden cat's eye chrysoberyl is very popular and readily available. Chrysoberyl is a very hard gemstone, 8.5 on the Mohs scale, making it a gemstone very suitable for jewelry. 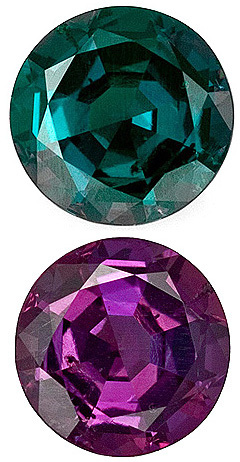 Alexandrite is truly a magical color change gemstone. It doesn't just change hues of color - say from pink to red or blue to green, but changes from one distinct color to another depending on the light source. Alexandrite will appear green (bluish green) in daylight or fluorescent light and will turn a red, purplish-red or raspberry red in incandescent light. Most people will never have the privilege to see an alexandrite that changes from a stoplight green to a stoplight red because they are so very rare. 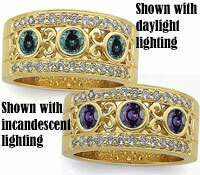 The Alexandrite gemstones shown above are graded Grade "GEM" on the left through Grade "A" on the right and are shown both in incandescent light and daylight. There are other color change gemstones like garnet or sapphire but alexandrite is the only color change gemstone that actually has its own very specific and strict scale for color change and that scale will affect how an alexandrite is priced. Well cut alexandrite larger than two carat in weight can be among the most expensive and rare gems in the world and the cost can be significantly more than a diamond of the same carat weight. Alexandrite is a Type II gemstone, so clarity is also very important. The closer the colors are to green and red of a pure hue the higher the value. Secondly the better the color change the higher the value. Either the green or red must be of a good hue. The degree of color change can only be truly evaluated with a single light source in a dark room. Traditionally a candle is the best light source to evaluate the red color! Although clarity is a significant factor in evaluation, an alexandrite with a poor clarity rating with a 100% color change is more valuable than an alexandrite with a 50% color change and a high clarity rating. Fine quality stones over 2 carats are both very rare and very expensive. Recently, the gemstone market has seen an influx of color change chrysoberyl that is being called alexandrite but it doesn't match the strict color change scale. Yes, it is color change chrysoberyl, but in order for a gemstone to be classified as an alexandrite, it must fall in the color change from green (bluish green) to red (reddish purple / pinkish purple). Anything else, color change from green to yellow for example, makes it a much less expensive color change chrysoberyl. Fairly recently, there has been chrysoberyl coming from India that is a beautiful bright green, but it doesn't have any color change. It too has been incorrectly marketed at alexandrite.Unfortunately, buyers are sometimes paying alexandrite prices for color change chrysoberyl gemstones so price isn't always a good guide to what the buyer is purchasing. On the other hand, some sellers are offering what they are calling alexandrite at fantastic inexpensive prices. In that case, if it sounds too good to be true, it probably is. Always keep in mind that in order to be a genuine alexandrite a gemstone must have the green (bluish green) to red (reddish-purple) color change. If at all possible, especially for larger (over 1 carat) alexandrite, don't purchase it unless it comes with a gemological certificate from a well known gemological laboratory. Bottom line always purchase alexandrite from a reputable seller who sells only professionally graded certified and guaranteed alexandrite. Is It A Genuine Alexandrite? Is That Heirloom A Natural Alexandrite? Synthetic alexandrite has been around in some form for at least 100 years. For example, synthetic corundum (sapphire) can have an alexandrite-like color change. There is also synthetic spinel that can mimic the alexandrite-like color change. Manmade (simulated) laboratory created alexandrite has been around since the 1970's. On a sad note: since synthetic sapphire posing as alexandrite has been around for at least 100 years, a ring that has been handed down from generation to generation and that has that huge alexandrite in it, is in all probability a synthetic. Alexandrite wasn't and isn't usually found in large carat weight sizes and the ancestors would have had to have extreme wealth and / or come from aristocracy 100 years ago in order to be able to purchase a 15 or 20 carat alexandrite.Laboratory and synthetic alexandrite is available in the marketplace today and is used in jewelry, but it must disclosed that it is manmade or synthetic. Where is alexandrite mined? There is virtually no alexandrite coming from Russia these days. Between 1833 and 2008, Alexandrite has been discovered not only in Russia but in Australia, Brazil, India, Madagascar, Myanmar, Sri Lanka, Tanzania and the US. This list may seem long, but the production of top quality alexandrite from any of these mines has been relatively small. Currently, the best alexandrite comes from the Hematita mine in Brazil. Alexandrite For Sale at AfricaGems.com Calibrated Standard size Natural Alexandrite Gemstones AfricaGems.com has the very best quality gemstones available on the market today. We source our small size Alexandrite from Brazil; from the famous Hematita mine that produces the finest color change Alexandrite on the market today. These gems, in the AAA grade display a beautiful and very strong color change from greenish blue to a pink purple. These gem Alexandrites make wonderful accent gems or combined together in a pave style make for some spectacular alexandrite jewelry. Our standard size Alexandrite is also cut to a higher standard than other small sized alexandrites. Our alexandrites are cut in one factory in Hong Kong that cuts only Alexandrite from the Hematita mine. Our calibrated Alexandrite is not lumpy and deep cuts that have no brilliance. They all have very good makes, symmetry and display excellent brilliance and intensity. All of our small sized Alexandrites are backed by our exclusive 100% refund policy and have a 30 day return policy. 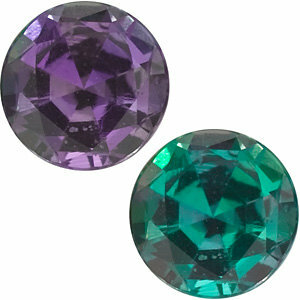 Alexandrite for Sale at AfricaGems.com Most gemstone dealers don't carry huge inventories of alexandrites. As a phenomena gemstone (color change), alexandrite gemstones have a more limited appeal to the gemstone consumer and jewelry designer. In the smaller size ranges however, this beautiful gemstone is affordable and readily available. 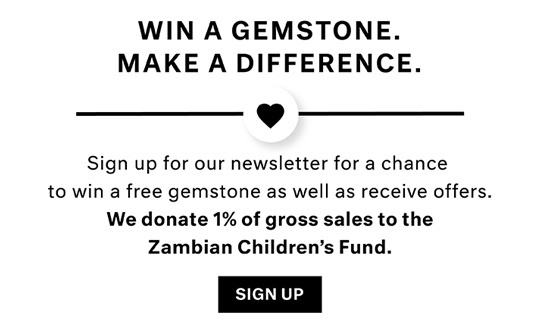 AfricaGems.com has more than 90 individual alexandrite gemstones in the 0.50 to .99 carat sizes available at any one time and ready to ship to you immediately upon your order. AfricaGems.com carries alexandrite from all sources; we have Brazilian alexandrites, Indian alexandrites, African alexandrites(Tanzanian mostly) and Sri Lankan alexandrites. Alexandrite gemstones carried by AfricaGems.com are not subject to any kind of treatments and all gemstones are completely natural. All of our alexandrite gems are subject to our strict quality standards and every gemstone would be an excellent choice for yourself or a loved one. Our alexandrite gemstones are backed by our industry leading guarantee policy. Alexandrite for Sale at AfricaGems.com Alexandrite gems in the larger sizes are very rare gemstones. Any alexandrite gem over 1 carat size in a finer quality is considered a collector gemstone. AfricaGems has more than 30 individual alexandrite gemstones available at any one time and ready to ship to you immediately upon your order. 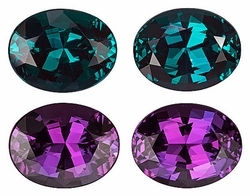 AfricaGems.com carries alexandrite from all the important sources; we have Brazilian alexandrites, Indian alexandrites, African alexandrites (Tanzanian mostly) and Sri Lankan alexandrites. Alexandrite gemstones carried by AfricaGems.com are not subject to any kind of treatments and all gemstones are completely natural and are backed by our industry leading guarantee policy. AfricaGems.com has a fabulous selection of extremely fine quality natural alexandrite rings that are in a quality class of their own. Only very fine natural alexandrite is used to make up these attractive rings, including our alexandrite engagement rings. Only the finest Brazilian alexandrites are utilized, that display a very strong 90 to 100 % color change. The Brazilian alexandrites are the best quality alexandrite gemstones available anywhere. 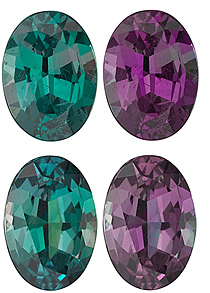 Much of the alexandrite jewelry seen today uses the Indian origin alexandrite, which cannot compare in the degree of color change to the Brazilian alexandrites. A beautiful selection of very fine quality loose genuine Alexandrites have just arrived. We have finally got some better imagery on these newer Alexandrites stones so that you can really see how dramatic the color change really is. These fine super gems have been selected for degree of color change, clarity, sizes and the quality of the cuts. In a very expensive material like Alexandrite, the quality of the cut is important as you don't want to pay extra for alot of extra weight on the bottom as is typical in most Alexandrite gems. Also have some very hard to find perfect matched pairs in super fine quality. Enjoy these very special gems.